This item will be released May 22, 2019. 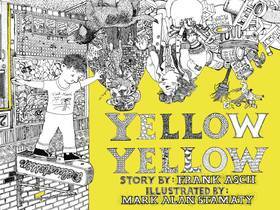 Yellow Yellow is a charmingly simple story of a child whose playground is a gritty urban cityscape. With no parent in sight, the boy wanders the sidewalks to find a yellow construction hat which quickly becomes his favorite belonging; earning him many compliments from strangers on nearby stoops. Eventually the boy meets the owner of the hat and must return it, leading the child to make his own yellow hat. Yet the story comes alive via the visual feast of urban oddities that the Who Needs Donuts? cartoonist Stamaty packs in the background of this rediscovered children’s classic. $9.99 This item will be released May 22, 2019.